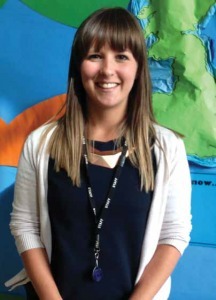 My name is Miss Lucy Jenkinson and I am in my fifth year of teaching. I currently teach Year Four. I have previously taught Year Four, Five and Year Six twice. What does it feel like to be a new teacher at a school? Being a new teacher can be really quite daunting! Getting to know the school site and where everything is can take some getting used to and I think new pupils must share this too. There are lots of staff members to get to know and learning everyone’s names on top of all the children’s takes a while. I think there are many similarities to starting as a new teacher and as a pupil; getting used to the new school site, new people to meet and get to know, new timetables to get your head around and getting to know how the school generally works. What do you do to prepare yourself for teaching in a new school? Like children starting a new school, we get a couple of days at our new school to meet staff, meet our new class and have a tour of the site. This is helpful to gather as much information as possible about timetables, staff members I need to know about and what my new class will be like. I usually go in over the summer to set my classroom up and start meeting staff and getting to know the caretaker: someone you should definitely have on your side! Originally I wanted to be a TV presenter or a journalist as I am interested in media, but helping teach ballet at my dance school inspired me to become a teacher. I had some fantastic teachers at primary and remembered how much fun I had and I knew from this that I also wanted to create and share these experiences for children. Do you have a favourite subject you like teaching most? I love teaching literacy. I enjoy reading and love literature and getting children excited about books and writing. What qualities do you need to have to do your job well? You need to be a people person. Engaging children in their learning at all different levels and learning styles requires you to be able to understand people and interact and engage with them on their individual level. You need to be organised – the list of jobs is endless and it’s important to try to keep on top of them. You need to have a good sense of humour and have patience and understanding for the children, staff and adults that you work with.